Happy Easter and Happy Passover to all my readers! This past weekend, I had the pleasure to travel to Cholpan-Ata, a small town bordering Kyrgyzstan's scenic Lake Issik-Kul, for a conference and workshop with some other scholars in the region. Prior to my trip, I had heard about Issik-Kul's natural beauty, but seeing it in person was another thing. The water was so clear and the shore was unsurprisingly free of litter and cigarette butts. I arrived in Bishkek a day before the conference and while you can take the trader out of the bazaar, you can't take the bazaar out of the trader! During my free day, I was able to visit Madina bazaar as well as Dordoi. Madina is a huge factory bazaar that caters to Kyrgyz domestic producers, while Dordoi is a wholesale bazaar that both competes with, and feeds into, Almaty's Baraholka. It was nice to go back and see Dordoi in season, as the last time I was there was early January. I chatted with the guy who sold me my fur coat in January for a bargain. As someone who regularly deals with customers and has a small portfolio of "regular clients," I appreciated the fact that he remembered me. We discussed "the trade" (i.e. business) and how the season soon picks up again. 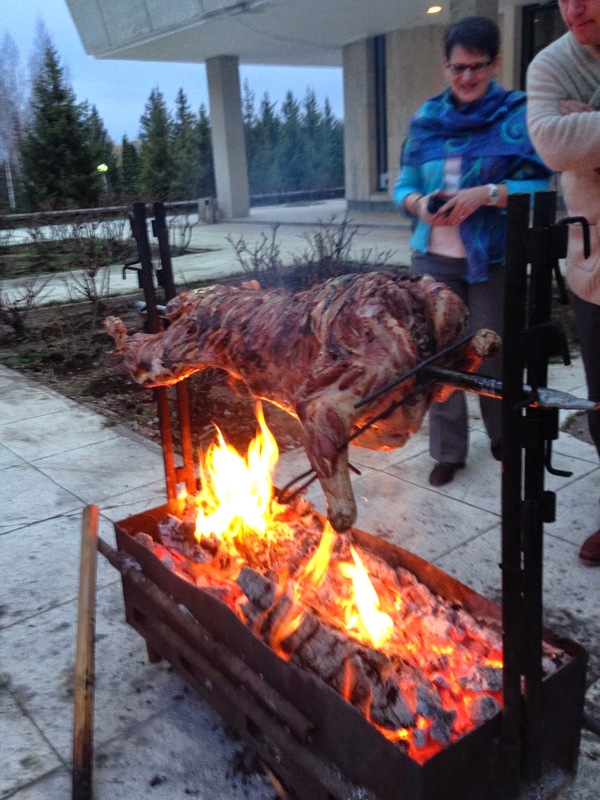 We stayed at the Hotel Aurora, a renovated Soviet-era Sanitorium. 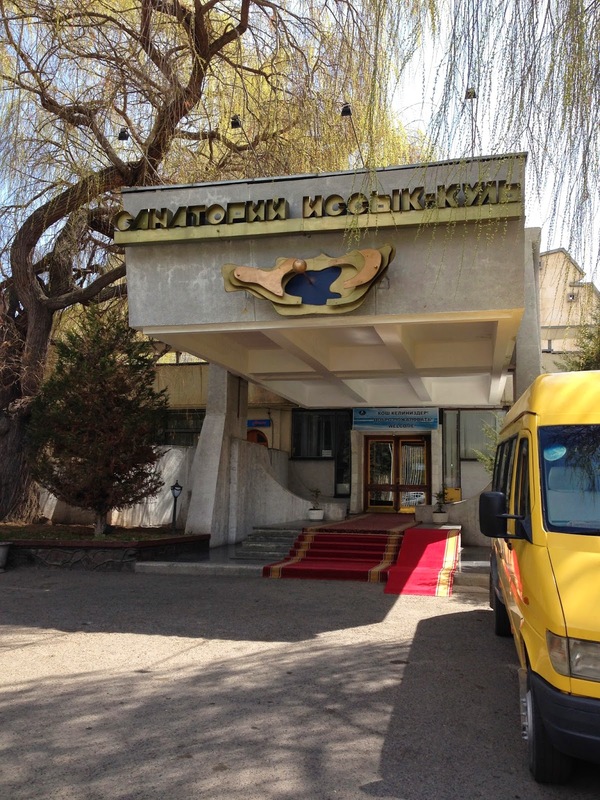 A Soviet "Sanitorium" is basically the equivalent of a health resort and country club. During the Soviet Union, citizens of all economic statuses (even though class technically did not exist) enjoyed their state-sanctioned vacations at various "sanitoriums" where they could go to the beauty parlor, swim, detoxicate in the sauna and receive other medical treatments. Apparently, the Aurora acquired acclaim during the Soviet Union as one of the premier vacation spots for members of the nomenklatura. Too bad I didn't bring my znachoki collection. While I would not classify the Aurora as a 5-star luxury hotel, the facility was clean, the staff was Soviet, and the grounds were beautiful and well-maintained. Plus, all rooms have balconies. The best part was the fresh air! OMG! Almaty is known for its smoke and the smog that coats the city. 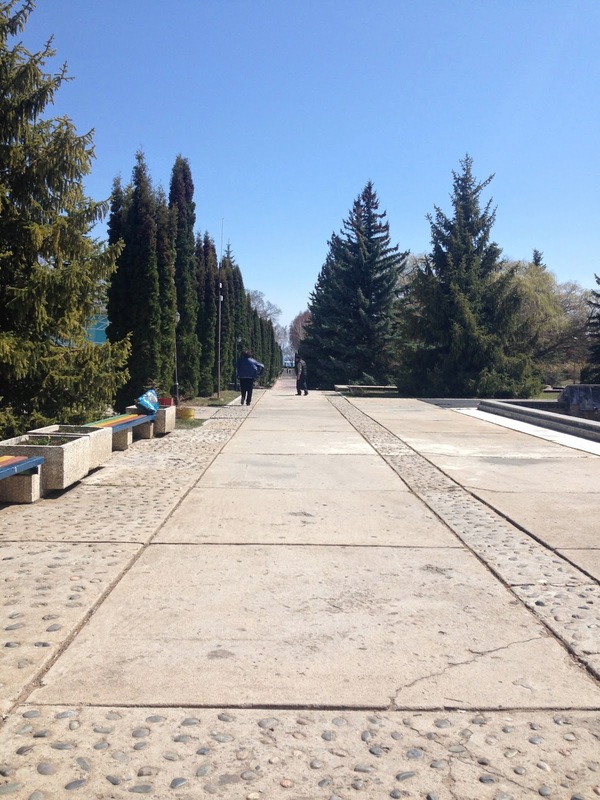 Almaty is located in the middle of the mountains, so there is little air circulation and all of the pollution accumulates and sits in the city. In fact, there is the "Almaty nose," which refers to the black snot that comes out of your nostrils onto your tissue when you blow your nose. There is so much dirt in the air here that it inevitably gets into your system. I originally thought it was just me and the intensity of my fieldwork, but it turns out, most people in Almaty have black buggers. I picked up some Dominican cigars in the duty-free zone at the Almaty airport for all of 6 euros a piece, as well as some vodka in Bishkek. So between the scenery, cigars, good company and Kyrgyz vodka, I must say that I relaxed in true nomenklatura style. I could not help but to think of the Russian Ambassador from Dr. Strangelove, who while entering the War Room of the Pentagon, requested hard-boiled eggs and "Havana cigars." When one official suggested a Jamaican cigar, the Ambassador responds, "No, I do not support the work of Imperialist stooges." Well, despite the fact that my cigar was from the Caribbean, I still relaxed in true- Sanitorium form. I'm now back in Almaty, and back to the grind. But it was a pleasure to go to Issik-Kul, and I highly recommend it! Plus, US citizens do not need a visa to go to Kyrgyzstan for under 60 days! Part of the grounds at the Hotel Aurora. The backside of the Hotel Aurora. Note the souvenir shop in the shape of a yurt, and the Aurora's signature sailboat architecture. Ironically, the grounds contained multiple statues of dinosaurs. We tried to make sense of that. My guess is that they found dinosaur bones in a nearby archaeological site, or the statue factory confused the orders and sent the hotel the wrong order, and the Aurora administration accepted the dinosaur statues nonetheless. Probably the latter. We had a lamb for dinner. Here it is roasting. Only in Kyrgyzstan. 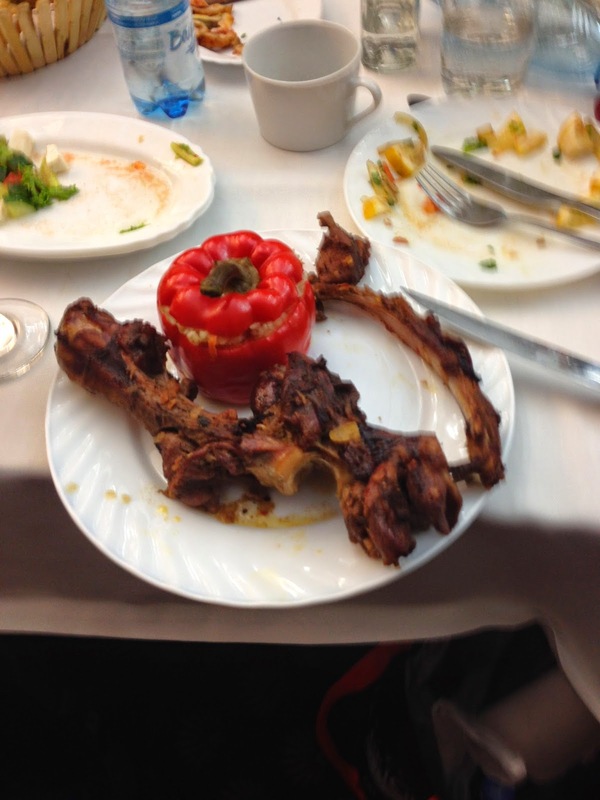 Waiters came out with plates filled with a bone and a stuffed pepper. Just picking the meat off the bone was filling enough. The scholar next to me commented, "I wish I could bring the bone home and make soup for days." That is something my mother would also say. Nonetheless, the meat was delicious. Easter Sunday breakfast! 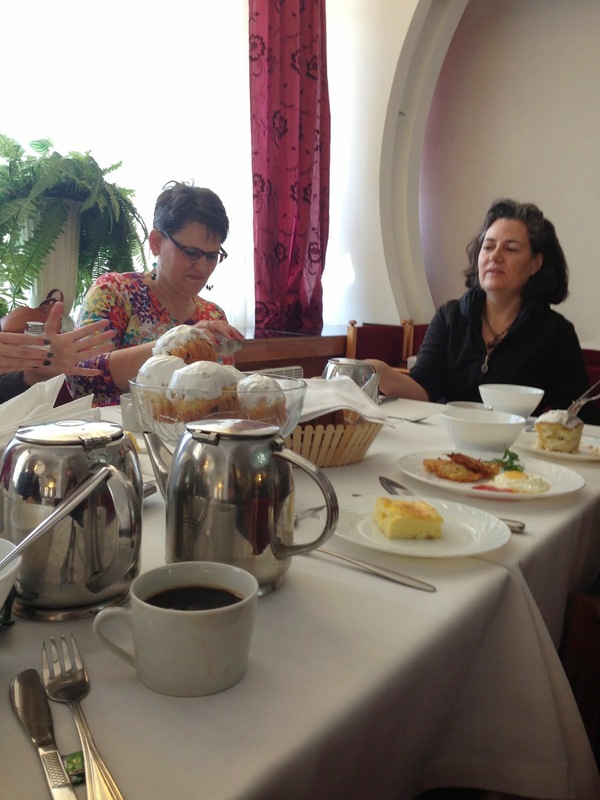 Notice on the table "Kulich" -- Russian Easter cakes. I would generally describe the cuisine at the Aurora as Soviet -- your mayonnaise-filled salads, meat cutlets and potatoes. It was not my favorite culinary destination, but A for effort. View of the Northern Tien Shen Mountains from the shores of Cholpan-Ata. "Sanitorii Issik-Kul" -- the entrance to the Hotel Aurora.